Hi, I’m Eric Samuelson, an independent Elite Consultant licensed by the Winslow Research Institute of Discovery Bay, California. WRI has conducted over 40 years of research into measuring high performers in many fields. I have benefited personally and professionally from the ideas I’m about to share. Please read on to see how you can benefit as well. If you are looking for powerful insights on how to position yourself for a great job, or to overcome struggles in personal relationships, I completely understand. You’ve come to the right place. If you are looking for work or considering a career change in this very difficult and competitive job market, you already know how vital it is to differentiate yourself from the rest of the applicant pool. If you sense particular strengths in your personality that need to be identified and developed so you can profit from each one. If any of these apply to your situation, you would benefit tremendously from this unique personal development service. Please read on…. Why are some people still stuck in a job which provides few rewards? Why are some still looking for employment? Interviewers are looking for anything that gives one candidate an edge over another. They can’t afford to make mistakes, and neither can you. That’s frustrating when you have a lot to offer and no one seems to notice. Economists worry that things will get worse before the turnaround arrives. You need an edge, RIGHT NOW, something that differentiates and strengthens you, and you need it NOW! We have the solution to breaking this logjam, and we’re making it available to you. A confidential password allowing you to take the profile. You take the Winslow Profile online when you are ready. Control questions ensure a valid, objective, and accurate report. You use your password to access the report when you are done. The next part of the package is The Success Traits Growth Analysis™. Finally, you will receive The Momentum Coaching Session™. We all realize that multi-million dollar contracts to play sports are handed out to the best athletes available. Skill on the field is essential. But, did you know that psychological factors are heavily considered when draft choices are made? Winslow Research has profiled tens of thousands of players and draftees for Major League Baseball, the NBA, and selected teams in the NFL and Pro Hockey as well as dozens of colleges and high schools. Results of these specialized Profiles are taken very seriously when offering scholarships or contracts to prospective athletes. Our hope is that three or fewer of your traits fall in the Concern section of the graphs. If so, that implies you have little to no incompatibility with your (desired) position. However, a number of traits in the Concern (red) boxes indicates you may be struggling which can create relational and emotional challenges. Let your Coach discuss the right overlay that fits you best. Since it’s hard for some to be open about personal issues, let me be transparent about my own personal struggles in years past. I’m a fixer; a solutions guy. People pay me pretty sizable sums to solve their business and personal problems. Okay, so that makes me a good consultant, but like a double-edged sword, that quality worked against me as well. In the interest of developing solutions, I often came across, especially with friends and family, as too clinical – lacking compassion. The very qualities that propelled me forward in business were sources of pain on the personal side. I struggled for years with showing people that I authentically cared about them. That all changed when I read an unfiltered, 45-page report from the Winslow Research Institute describing two key traits deep within my personality: Recognition and Nurturance. These two qualities had repeatedly conspired to create offense in my key relationships. Shakespeare eloquently wrote, “To thine own self be true…” I felt I needed to own up to the results of the Winslow profile, so, along with a personal coach, I determined to make changes immediately. Before long my family and my professional colleagues noticed a positive change in my behavior – more empathy, less analysis — all because I had clear, direct knowledge from Winslow Research describing how my personality was creating behavior that offended others. This was not a temporary fix. The changes lasted and conflicts were avoided. Just reading the Report provoked a small revolution in my attitude. Having a Coach run the race with me was a huge help. First, I became aware of the issues and eventually my behavior changed, showing positive results to my friends and loved ones. I promise the same can be true for you. The change can be rapid once you have this valid, objective report in your hands. YOU NEED A JOB? WE PROVIDE THE ANSWER TO ACING THAT INTERVIEW! Questions the Winslow Reports Will Answer! Is this applicant a success-oriented individual? Ambition: describes whether this is a competitive, goal-oriented person with a strong desire to successful. Self-confidence: Is this person highly confident, truly believing they have what it takes to be successful? Conscientiousness: does this person place the welfare of others before their own personal self-interest? Coachability: describes if this person respects authority figures (their managers) and willingly accepts leadership and direction. Flexibility: does this individual readily adapt to the organization’s methods of operation and decisions, or will we see resistance. Contentment: Is this a happy person with a positive disposition, rather than someone who is disenchanted with life. What is this individual’s interpersonal orientation? Leadership: does this individual believe enjoy managing, motivating and being responsible for others. Sociability: discloses whether the applicant is a people-oriented extrovert or an introvert who focuses on “things” and avoids contact with others. Nurturance: these individuals are keenly aware of and sensitive to the emotional needs of others and readily respond with sympathy and support. Alertness: measures the individual’s inherent ability to learn quickly, understand complex situations and successfully solve problems. Structure: indicates how organized one’s thinking, planning and actions will be. Such people will be highly mentally structured and disciplined. Order: tells us if they will keep their physical surroundings neat and orderly. They will have a place for everything and everything in its place. Control: will determine if this person is impulsive and talks or acts without thinking, or rather someone who will control their impulsive behavior. Composure: predicts the ability to remain calm and to function normally when problems occur and emotional stress is encountered. Tough-mindedness: enables a person to cope with challenges, function in uncomfortable environments and recover quickly from disappointments. Autonomy: will disclose if this is a team-oriented or team-dependent individual. Does he contribute and act cooperatively, or avoid contact with others. Sociability: how well does she enjoy interacting with others. Will she be perceived as a warm and friendly person others enjoy being with. Endurance: tells us about the level of inherent physical energy and persistence which is normally required to prospect, make presentations and close sales. I’ve been coaching and consulting around the Winslow Profiles for 15 years. I’ve personally witnessed rapid, dramatic positive transformation in people who have trusted the profile results and then acted on the guidance. Of course, others read their Report and put it on the shelf. They now have the smartest bookshelf in town, but it doesn’t do them any good personally. So, we added a free coaching component to be sure our good customers would receive the full benefit from their Winslow Assessment. Are you looking for work? Is the competition pretty fierce? Ask your coach to identify the trait clusters which identify special patterns of behavior. Are you an Innovator, an Organizer, or perhaps a Natural Leader? Certain trait combinations tell us quickly where you are at your best and where you are most vulnerable. WHAT IS the WINSLOW RESEARCH INSTITUTE? Winslow Research Institute has provided its Behavior Assessment Systems to organizations, professional sports teams and individuals for over 40 years. Personal coaching organizations including Franklin Covey, Professional Education Institute and others, leading authors like Robert Kiyosaki, Jack Canfield, Steven Covey, Zig Ziglar, Denis Waitley, Brian Tracy, and hundreds of coaches utilize the Winslow Reports in their programs. 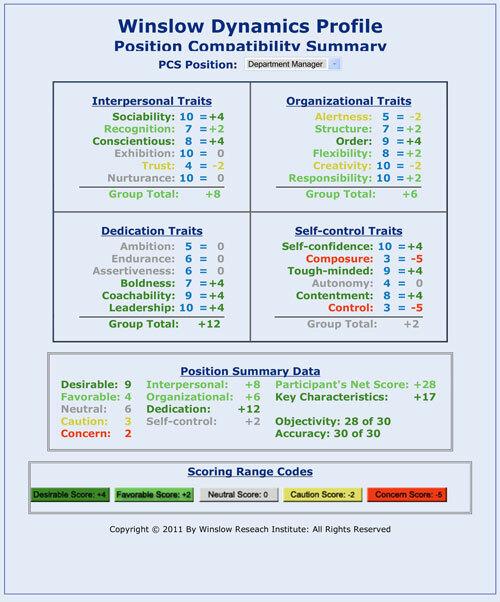 Your Winslow Report is prepared from the results of the Winslow Dynamics Profile, a validated personality assessment instrument that measures personality traits. 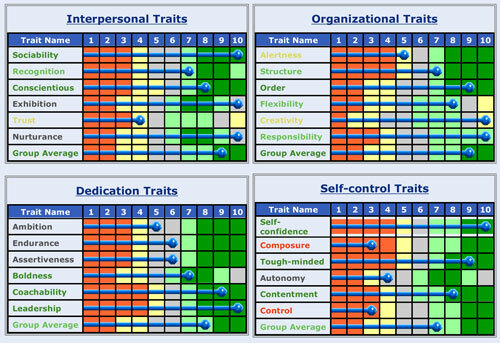 This comprehensive Profile measures the 24 personality characteristics related to career success and personal contentment. The Profile is Internet based, user-friendly, and enables you to complete the Profile at your location and convenience. The Profile takes less than one hour to complete, and your results are available on the Internet shortly after the Profile is complete. From the results of your Profile we prepare a 45-page Report presenting objective information on your personality, behavior and attitudes. With this information you can capitalize on your personality assets, modify your behavior and achieve the results you seek. The results will help you achieve success in your career and contentment in your personal lifestyle.